With no data on the table i can pretty much that either your injectors or map sensor might be faulty. - Did you notice the volts while the car was running rich ? I've got the MAP sensor logged. It could definitely be the scaling though. It seems to be outputting a good number in the log, but it's not an officially supported MAP sensor. Corbin (my tuner) made a scaling for it that he said would work though. It's a GM 4 bar. I can't run a standard Evo map sensor because the JDM manifold doesn't have a provision for it. Tuning SD is one of those places where my knowledge is still lacking, so I'm not sure how to tell if the MAP sensor scaling could be the issue. Now you are talking. 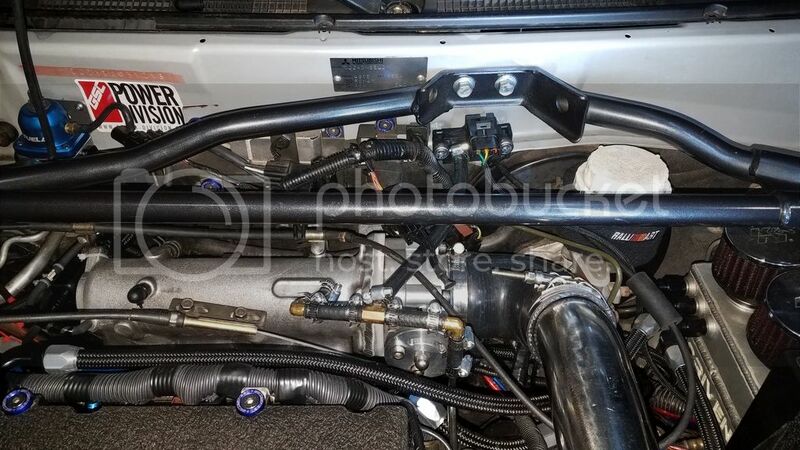 Can you post up a pic of your intake manifold and bin file if your tuner doesn't have an issue? Can you fit a jdm evo 7 intake manifold ? I'll probably pick up a GM 3 bar MAP since the scaling for that one has been set up in ECUFlash already and I've got the rest of the car set up to run a GM style MAP. It's just this oddball GM 4 bar that doesn't have a proper scaling. Basically this is an Omnipower GM 4 bar MAP. I had originally assumed that the Evo Omnipower 4 bar MAP would have the same scaling when I ordered it. When I got the car to the tuner I found out this wasn't the case. He said it would work though and made a scaling for it using custom "SD MAP Sensor VE and Calibration" numbers and the setting for the Omnipower Evo style 4 bar. I think it's definitely a possibility that that's what the problem is. The bin file is the standard one for Tephra v7. No custom scripts added. Aah Great ! Hopefully this will resolve the issue. Fingers crossed. Yep, we shall see! I'll order one when I get back from Pikes Peak. The PPIHC race is this weekend and I'm driving out there with a buddy of mine for it. I second the MAP sensor! Had a very similar issue before. Either way good luck and let us know what you find!! Also do you think setting the car up to just run on open loop just to see what it does may help you narrow it down? Just a thought. You mentioned you deleted your pcv, and added a catch can. That's great but if done incorrectly then that's your issue. did you not add a check valve to the catch can loop? If not then it's a vacuum leak, so at cruise your fueling is all over because of that. What are your trims like? I suggest putting the pcv back. You should have a line from your intake manifold going to the can and also another from your pcv going to it. And cap the vent. This way you don't bleed crankcase pressure. Hope this input helps, something mechanical cannot be diagnosed over a computer, but it's an idea for you! Good luck! and drive the car. Over the time if it gets worse then it will show up which part is causing this problem and easier to identify. The problem is that is DOES do this cruising. The car kicks and bucks all over. Makes the car nearly undrivable and ruins the experience. It really beats you up! I did make another small discovery today. If you look in the video when the car gets up around 4k rpm the wideband is showing super rich in the 11.0-12.0AFR area. In the tune it's supposed to still be at a stoic 14.7AFR. I think this might be a big piece to the puzzle. Tried shortening the vacuum line from the MAP sensor just to see if it made a difference. It didn't other than tidying up the engine bay a bit. AEMPro how can i tell if im in Open Loop or Closed loop? Is there a way to make CLOSED LOOP richer without touching OPEN LOOP? How to log afr via Aem Uego and evo scan?